LASIK and the other refractive surgeries are covered in a number of other websites and I won’t go into much detail here. I’ve included a number of pictures and animations. What is important is that you choose your surgeon carefully. You want a surgeon who is conservative and will tell you if you are not a good candidate. Don’t look for the cheapest, either. If it was my eye, I would get the intralase and I would consider the custom wavefront option if my prescription was -6.00 or higher. The pictures above show from left to right, the creation of the flap, the laser ablation and the closure of the flap. 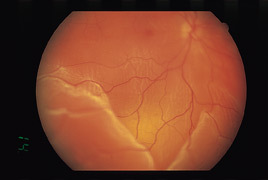 Picture of a normal retina showing the optic disk, the blood vessels and the macula in the center of the photo. 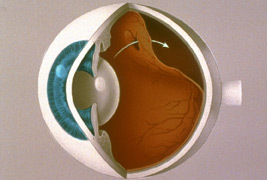 Rhegmatogenous retinal detachment showing the hole in the inner retinal layer, allowing fluid to separate the inner and outer retinal layers. 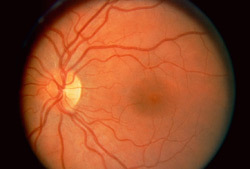 Unless corrected, this results in total blindness. 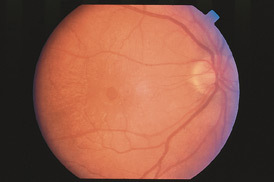 Branch Artery Occlusion showing the emboli blocking the artery just above the optic disk. The bright spot is the emboli. 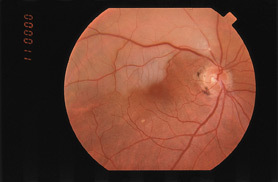 Rhegmatogenous (hole present) retinal detachment. 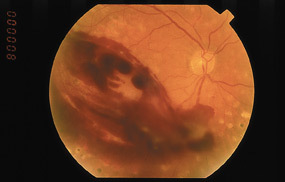 Macular Hole seen as a round red area in the center of the picture. 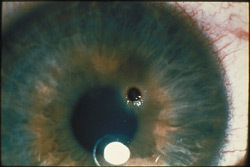 Rusting piece of metal in the cornea.